Guest blog – Bowland: crimes against nature by Eleanor Upstill-Goddard. 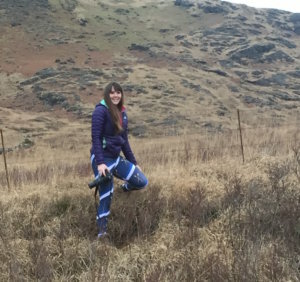 Eleanor is a wildlife conservationist and raptor enthusiast from Northumberland with an MSc in Biodiversity Conservation and Ecosystem Management from Newcastle University. She indulges her passion for wildlife through photography and writing. We have all heard of the expression ‘to turn a blind eye’, meaning to pretend that a particular act or occurrence has gone unnoticed and unregistered, to ignore something or even to neglect it. I am sure there have been times in most people’s lives where they have ‘turned a blind eye’ to something. Though (hopefully!) these incidents have been rather minor ones, incidents like pretending you did not see your little brother smash your mum’s vase, or ignoring the fact that your dog just ate your favourite pair of shoes. They are incidents that are minor irritations, but they are not ones that will not have a greater impact on our lives and not generally things of huge importance. They are not for example, ones that could impact the natural world, the ecosystem, or to be more specific, the protection of our birds of prey. Raptors. Possibly the longest suffering of our surviving wildlife in the UK and when it comes to persecution of these species, you could say the UK has become something of an expert at turning a blind eye. Our shores are home to so many examples of raptor persecution that we would be spoilt for choice for incidents to discuss. In this case however, we are talking of a very particular incident. One that screams the serious neglect of our raptors. So, where in the UK are we? Lancashire. The home of the Red Rose, Victoria Wood, Ian McKellen and, of course, The Forest of Bowland. An Area of Outstanding Natural Beauty, covered in vast and diverse habitats including fells, valleys and peat moorland, a Special Protection Area (SPA) for birds of prey, and a haven for some of our most spectacular raptor species, including the Hen Harrier and the Peregrine Falcon! Or at least, it should. Over recent years however, a black cloud has descended over The Forest of Bowland. A black cloud that has brought with it the wide-scale, relentless persecution of birds of prey. The situation has now become so serious in Bowland that the region is what some people (the term originating with gamekeepers) call a ‘Raptor Free Zone’. The fact that such a ‘zone’ should exist in an area where these beautiful birds are native is not only a tragedy, but a total and utter embarrassment to our nation. The Peregrine Falcon, is a spectacularly agile, wickedly fast and beautiful bird of prey, who can usually be found in areas of upland moorland during the breeding season. Nowadays however, there are more breeding pairs existing in London than across all the moorland in northern England. Moorland where red grouse shooting serves as the main upland land use. Seven years ago the story was very different, Peregrine Falcons were thriving throughout Bowland and there were at least 18 occupied Peregrine territories, with approximately 11 successful nesting pairs in most seasons. However, something changed in 2010, as the number of breeding Peregrine pairs in Bowland began to decline dramatically and many territories were left abandoned. Coincidentally (hmmm), 2010 was also the year when Natural England instructed the British Trust for Ornithology (BTO) to revoke Schedule 1 disturbance licenses held by members of the The North West Raptor Group, who have monitored and protected raptors in the Forest of Bowland since 1974. Why? It was claimed that there was a concern that these raptor protection specialists would ‘disturb’ the birds and duplicate nest visits, threatening their chances of breeding successfully. However, somewhat bizarrely, they continued to grant the group raptor licenses for use outside of Bowland, including licenses to monitor Golden Eagles in Western Scotland. With no seemingly legitimate reasons provided for this removal of licenses, such a decision could be seen as something highly suspicious. Perhaps they did not want this monitoring to continue? Perhaps they have something to hide? Or even somebody’s interests to protect? Certainly not the interests of our raptors it would seem, especially when we remember that it was also Natural England who last year granted licenses to gamekeepers allowing them to shoot Buzzards, so that pheasant stocks could be protected, with little (if any) justification for such a decision. Since Natural England took the decision to revoke disturbance licenses held by members of the NWRPG, 16 breeding Peregrine nesting territories now lie abandoned in Bowland. In addition, 7 pairs of breeding Hen Harrier, the symbol of The Forest of Bowland and a species on the brink of extinction in England, have also been lost from the area. But perhaps those of us who question these decisions and their outcomes are just being too cynical? Jumping to irrational conclusions even? Unfortunately however, for those of us involved in raptor protection, cynicism has become somewhat ingrained within us, not because we wish it, but purely because we have been given too many reasons to think in such a way. It’s curious. Very curious. So what is going on? How could 99% of Peregrine Falcon territories possibly have been found abandoned throughout the Forest of Bowland since 2010? Flooding? Disease? A plague of locusts? I think we have all guessed what could have caused such a devastating collapse of a local population. Persecution. Why? The same old reason: to boost Red Grouse stocks (because they are suffering terribly). In Bowland, it seems as if there is a constant and unrelenting witch hunt being carried out against birds of prey, the Peregrine and Hen Harrier in particular, as well as against those individuals who have dedicated their lives to protecting these birds. Nesting sites have been destroyed, eggs have been taken, chicks have disappeared, and 16 adult pairs of Peregrine Falcon have been lost from these now abandoned territories. But these losses are no secret, nor a revelation. This is no MI5 operation that must be kept from everyone except the powers that be, for ‘the greater good’. This is known about by many, but so far, the pleas and protection efforts exhibited by those members of the North West Raptor Protection Group have fallen on deaf ears. Or perhaps just unwilling and uninterested ears. Sadly, the situation is not improving, if anything, it continues to deteriorate. An example of this took place not so long ago when a water metering system was installed in a stream bed on moorland owned by United Utilities. Although this in itself may not sound like an issue, it was not the installation of the system that caused the problem, but rather the location of the system. Where was this? Shockingly, right next to an area which has been identified and used as a Peregrine nesting site for many years. Unfortunately, this was no isolated incident as 100 metres directly opposite from the same peregrine nesting ledge, a gamekeeper had installed a crow trap overlooking the nest site. Strange, is it not, that highly trained and experienced members of a raptor study group would be denied licenses to protect these birds in case they should ‘disturb them’, yet a water metering system (which would regularly be checked) and a gamekeeper’s crow trap (also regularly checked) should be conveniently installed right across from a historic peregrine nesting site! Surely, anyone possessing even the slightest ounce of common sense would see that this would cause great disturbance if Peregrines returned to breed at this site in the future! But it does not stop there. In many areas, almost right on top of other Peregrine sites throughout Bowland, vermin traps (designed to catch weasels, stoats and a variety of corvids) have been installed alongside or close to abandoned nesting sites, which again, must be checked on a regular basis by the gamekeeper. Can this really just be passed off as innocent or unaware disturbance to sites, or is this blatant and unabashed intrusion to prevent breeding taking place? So how can this be allowed? Naivety? Sheer incompetence? Or worse? Are these planned strategies to prevent any prospecting Peregrine from settling down to breed? With a fresh dose of that cynicism, I am going to fall (rather dramatically) in the direction of the latter. To document every single outrageous and fundamentally unfair event that has occurred within the Forest of Bowland over recent years would be a bit like me trying to document every single significant act of the World Wars in one (reasonably sized) article. It would be impossible. Unfortunately for our raptors, this is their own version of War. War against the Red Grouse shooting industry and those who are willing to stop at nothing (even the law) to boost their grouse populations and consequently their profits. Sadly, the Red Grouse industry will always have one thing behind it that gives it the upper hand, no matter how immoral. Money. Money makes the world go round it would seem, even when it comes at the cost of losing some of our most precious and threatened raptor species. And what of Natural England’s position in this rather dirty game of politics? It seems that by denying licenses preventing a dedicated raptor group from protecting threatened birds in the Forest of Bowland, they are providing support to estates owners and their gamekeepers. Such a decision, which has possibly been approved at the highest level, indicates that they are almost allowing raptors to be destroyed with impunity in Bowland. They are, quite simply, turning a blind eye. Raptors have been shot, trapped, disappeared and driven from the Forest of Bowland and this trend is forever continuing and increasing. The situation in Bowland is nothing short of dire, with raptors and those who work for them constantly fighting what currently seems like a losing battle. In 2017 it would still seem that the care we have for our environment and our wildlife and ecosystems has not come far at all, with those who commit crimes against our natural world escaping unscathed and with nothing but a slap on the wrist (if that). If something does not change and change soon, these beautiful birds that we have the privilege to see in our country will disappear into nothingness. Disappear into a silent, desolate moorland, where no life but that of the Red Grouse will continue to flourish. It’s dire, it’s depressing, but it is fact. However, we remain defiant and determined, and although the persecutors of our birds of prey may be winning this battle, we refuse to let them win this war. 6 comments to Guest blog – Bowland: crimes against nature by Eleanor Upstill-Goddard. I must admit I know nothing of the licensing system but what the hell is a ” disturbance license ” when it is at home and is it a different animal from the license given to ringers . I thought the idea was to leave nesting birds in peace and quiet . On reading various blogs the NWRG at least seem to be doing what they can to protect nesting raptors in Bowland unlike a lot of the keyboard warriors cluttering up the internet. As an outsider there does seem to be a bit of a turf war between various raptor groups RSPB etc with everybody and their uncles fitting sat tags and not sharing information while the birds suffer. Not a good look. A well written and informative piece for which many thanks. But how many eyes will it reach on here? The problem of Bowland’s, and England’s, Raptors needs a much wider audience and the message it contains needs to be rammed, forcibly if necessary,under the very noses of those who made the appalling decisions in 2010 and subsequently. Editors of National Newspapers are looking for stories in the ‘silly season’ do why not start there? Perhaps a copy, neatly printed with a couple of illustrations of Peregrines at nest and a Male Hen Harrier, sent to all registered shareholders of United Utilities Plc. would do no harm. It is time to take the initiative in this ‘war’ and not wait for it to come to us. Well written. It is a national disgrace. Is this Country any better than Malta in it’s treatment of wildlife? Yes, but not by a great deal sadly! A depressing read indeed, makes my blood boil. In my youth I remember regularly seeing raptors on my trips to Bowland, very sad to hear that the breeding pairs have been so decimated by people who clearly have nothing between their ears. I wonder what these people will do when we have no biodiversity? I seriously hope our present Government start to take notice to what is happening and actually does something. Editor’s Comment. Dave don’t hold your breath for any Tory administration doing anything to bring the ongoing killing to an end. The Tories have too many supporters who shoot to consider first.